Deep In The Pacific, Scientists Discover Biggest Volcano On Earth : The Two-Way Tamu Massif, first thought to be perhaps dozens of individual volcanoes, turns out to be just one — but it's really big. It's about the size of New Mexico. The newly revealed Tamu Massif volcano — located about 1,000 miles east of Japan and 4 miles below the ocean's surface — is about the size of New Mexico. It not only outclasses previous record holder Mauna Loa in Hawaii by about 60 times, but it's in the same league as Olympus Mons on the planet Mars, the largest known volcano in the solar system. It's "a gee-whiz moment, where we say, 'There are volcanoes here as big as any we've seen elsewhere in the solar system,' so it's sort of like discovering a new whale or something like that," William Sager, a professor in the Department of Earth and Atmospheric Sciences at the University of Houston who began researching Tamu Massif two decades ago, tells NPR's Christopher Joyce. "If what they are saying is correct, that is truly a massive volcano," Brian Jicha, a geologist at the University of Wisconsin, says in an article published by National Geographic. Nature.com reports that the mega-volcano has been inactive for millions of years, but "its very existence will help geophysicists to set limits on how much magma can be stored in Earth's crust and pour out onto the surface." The 120,000-square-mile shield volcano took a few million years to take shape when it formed about 145 million years ago at the transition between the Jurassic and Cretaceous periods, according to Sager. It's not tall, but it is extremely wide — a veritable undersea behemoth compared with land-based Mauna Loa, which measures just 2,000 square miles. 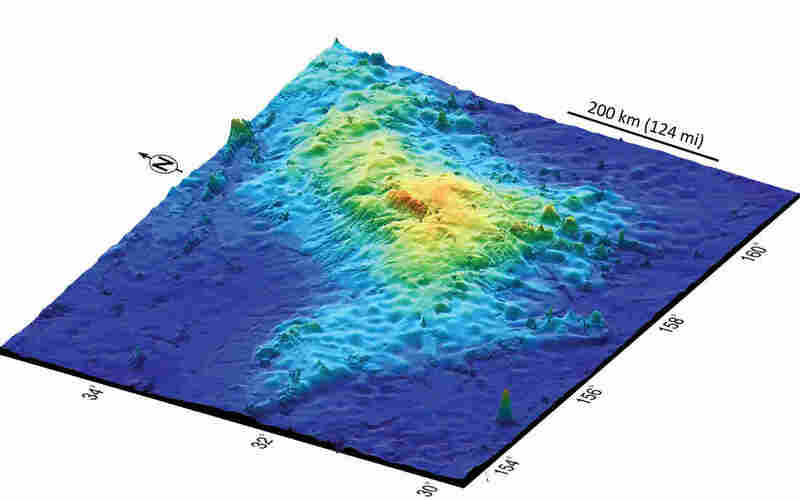 Tamu Massif comes close to matching the geographic size of Olympus Mons. The volcano is part of a larger underwater feature known as the Shatsky Rise, but only in the past few years has Sager's team been able to determine that it's a single volcano. "We knew it was a big mountain, some sort of volcanic mountain, but oceanic plateaus are very large features hidden beneath the ocean and it's very hard to study them," Sager says. "The main thing was the imaging we were able to do a few years ago, but without sort of the ground truth provided by samples that we drilled out of this thing, we wouldn't have had nearly as compelling a result," he tells NPR. Sager says before the discovery that Tamu Massif is a single volcano, scientists had expected that "something this big must be made up of a large number of volcanoes, two, three, four dozen, you just don't know." "[We] really had no idea until we started to look at the seismic data that the lava flows all come from one place at the top of this thing," he says. And if you're wondering what Tamu means, it's an acronym for Texas A&M University in College Station, Texas — that's where Sager worked before joining the University of Houston. "I think the Aggies are very happy about this," Sager tells Joyce. "In fact, all the stories up in College Station lead with that fact. ... It's the world's biggest volcano, of course ... but the fact that it's named after the Aggies is the most important thing."